Some of the simplest tips can be the most useful. This week’s tip comes for Tina, our Education Manager. 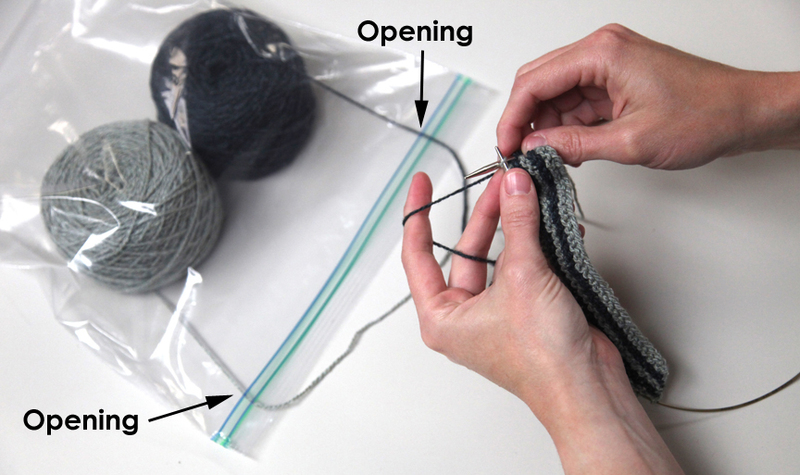 If you are working with two balls of yarn and need to keep the strands separate, but also need to keep the yarn in the same bag, use a zip-top bag. Zip the bag closed for a few inches, feed the first yarn out of the bag, zip a few more inches, then pull the second strand out of the bag. The zipped spaces will keep the two strands separate outside of the bag! How else have you used zip-top bags to organize your knitting and crochet life? Share your ideas with everyone in the comments. Dena started working at WEBS in 2006, shortly after she learned to knit. She also dabbles in crochet and weaving. She finds knitting complements her marathon and triathlon training really well. This entry was posted on Tuesday, May 8th, 2012 at 10:00 am	and is filed under Tips & Techniques. You can follow any responses to this entry through the RSS 2.0 feed. You can leave a response, or trackback from your own site. I use them as project bags, especially when I need to go out to run errands and don’t want to be caught in a queue or in a doctor’s waiting room without a project. I keep all of the tiny balls of yarn left over at the end of a project in a gallon-size bag that way they don’t get lost at the bottom of my baskets. I use the heavy-duty zip top “school supply” bags to organize my circular needles….and they all have 3 hole punches so fit in a thick binder. I actually clip off a corner and pull the yarn out….that uses two sandwich bags, not one, but the zipper (on the other end) stays shut! I like zip-top bags for controlling fuzzy specialty yarns so I don’t end up wearing the fuzz when I take a project with me. With cotton yarns and black pants this is a plus. That’s a good reason for using zip lock bags. Never be caught without your knitting or crochet project. Thanks for sharing with us. Great idea and works well. Thank you! It works really well if you cut two little x’s on the flat side or at the bottom and then zip the bag completely closed! I use zip locks for my srap balls,the hook tape scissors and project notes even patterns on index cards for my project. Nice and neat and I know what is what.